In the past year, California saw a number of extraordinary wildfires, including October’s Tubbs fire north of San Francisco and the Thomas fire near Los Angeles in December. It generally takes a confluence of factors to produce destructive fires, and 2017 saw especially dry conditions continue into early winter—overlapping with exceptionally strong, fire-stoking Santa Ana winds in the case of the Los Angeles area fires. So how much blame does climate change bear for these weather conditions? And more practically, what should Californians expect from future fire seasons? Is this, as California Governor Jerry Brown put it, “the new normal”? Inspired by a discussion among scientists started by journalist Andy Revkin, Climate Feedback invited a number of researchers in the field of fire science to weigh in on questions related to California’s fires. Their answers below help clarify how we should approach understanding this complex topic. While many different human activities can affect the ignition of fires and the number of structures at risk from fires, natural weather variability plays an important role. But overall, the scientists note that projected trends in temperature and precipitation point to increased fire risk in California. 1. 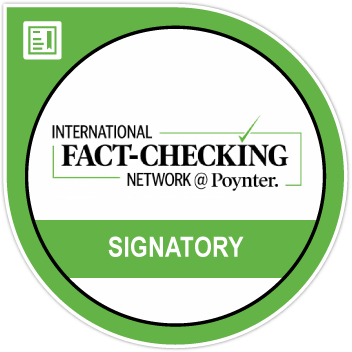 Is the national conversation on the complex topic of climate change and California fires (e.g. stories in Vox, Rolling Stone, KQED, or NBCNews) missing something? In many of these conversations, the question is framed in a fairly reductionist way: “Did global warming cause the California fires?” A more nuanced and scientifically-answerable question might be: “Has global warming increased the likelihood or severity of large late-season wildfires in California?” Obviously, there are ongoing scientific studies that will help to answer this in a more quantitative way. But it’s pretty clear that the observed warming and drying trends (and associated drying of vegetation) are increasing the risk of large, intense fires when weather conditions are otherwise conducive to their occurrence. Some of the media stories linking climate change to major fire events are distractions to the real problem. The media was reporting climate change as a major factor in the Sonoma fires and Ventura fire, yet these were extreme wind events. This distracts from some major problems, e.g. Cal Fire has historically labeled communities at high, medium or low fire risk based on fuels, and the global warming story feeds into this approach. However, it is clear that these wind driven events caught fire agencies off-guard in that winds were not incorporated into fire hazard maps. 2. What were the weather conditions that made the recent winter fires so bad? The severity of the recent fires was driven by two key factors: 1) strong, persistent, and extremely dry Santa Ana winds and 2) record or near-record dry vegetation for the months of November-December. Vegetation in coastal California typically reaches peak dryness in the autumn, then moistens quickly thereafter following the onset of the rainy season. In late 2017, however, the rainy season in southern California arrived very late (January)—meaning that vegetation retained summer-like dryness through the autumn and early winter. In addition, record-warm summer temperatures throughout California preceded these fires, and record warmth persisted into autumn in southern California. Thus, the combination of a late start to the rainy season and record warm antecedent temperatures yielded explosive fire potential; the occurrence of Santa Ana winds in December unfortunately helped to realize that potential. It’s also worth noting that Santa Ana winds are not rare in December (indeed, it’s close to peak season gusty, dry, land-to-sea wind events). But peak Santa Ana wind season usually occurs after substantial winter rains have occurred, which acts to greatly reduce fire risk. After the enormous Thomas Fire in December 2017, it’s now abundantly clear why the timing of rainy season onset relative to peak Santa Ana season is very important. Both the Sonoma-Napa fire storm and the Thomas Fire in Ventura County were heavily influenced by anomalous weather events. While foehn winds (North Winds in the north bay area and Santa Ana Winds in SoCal) are common weather events, this year the events were anomalously severe relative to historical patterns. Of course the climatology is important to this issue but it is critically important to translate this into fire behavior. While it is an important observation that temperatures were hotter in 2017 that does not automatically result in bigger fires. Temperature and precipitation is going to translate into fire behavior through its impact on fuels (plant material available to burn). In terms of live fuel moisture, a hotter, drier summer and fall does not in and of itself translate into a greater propensity for burning. Studies show that in the fall in southern California, live fuel moisture is at rock bottom during normal years, and it is no lower following extreme conditions of precipitation or temperature (i.e., live fuel moisture levels are always at the lowest level by October of most years). What extreme conditions can do is produce dieback, but that is something that needs much more study, as we have little data on dieback prior to the Thomas Fire. As for Santa Ana winds, it is important to realize that the 30 year relationship between number of Santa Ana wind days and area burned shows no correlation*. Santa Ana winds occur every year, but most years do not result in significant fires because that is dependent on the timing and placement of an ignition at the time of the wind event. While there have undoubtedly been significant Santa Ana wind events of some duration in the past, those associated with ignitions have usually been 2-3 days. 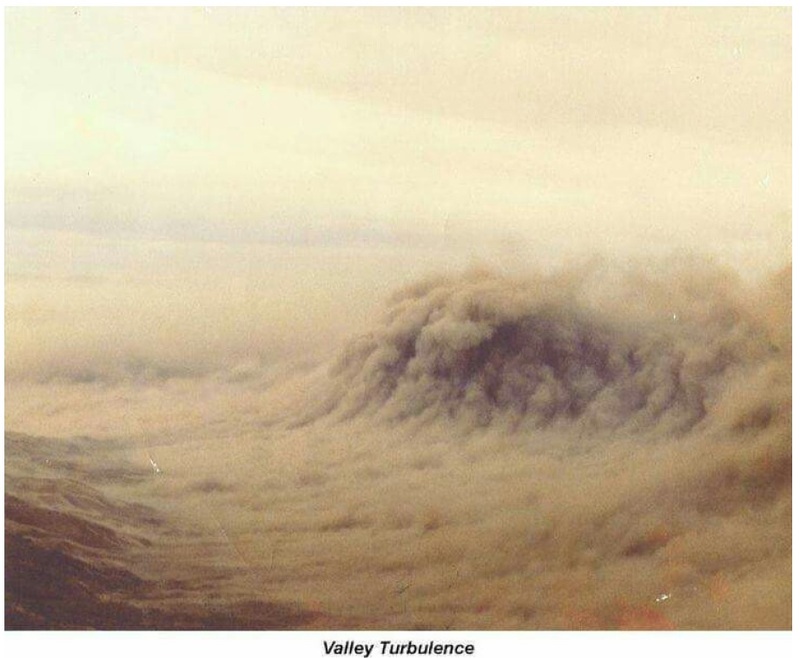 If fires just magically appear every time we had a severe wind event, one could only imagine what the fire outcome of the 1970s Arkins Santa Ana wind event would have produced (see below illustration of the dust storm below the Grapevine) with winds estimated at 190 mph. In short, what is important is the intensity and the length of the Santa Ana wind coincident with an ignition. Both of these fires were preceded by several months of persistent anomalously warm and dry weather. The Thomas fire occurred relatively late in the season—it is not unusual for Santa Ana winds to occur in December, but it was quite unusual that there was so little precipitation in the prior fall months. I’m not sure that warmth was the primary driver (surely the Diablo wind event was, and the 1964 fires in Santa Rosa were not preceded by an unusually warm season). 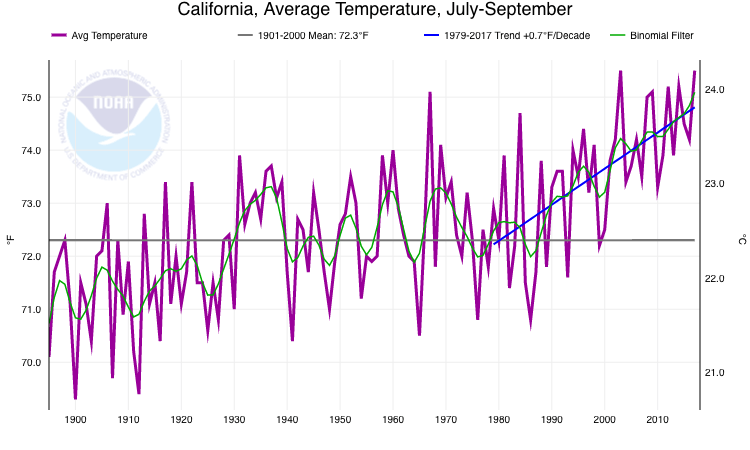 But 2017 was unusually warm for quite a spell—see Sacramento and San Francisco temperatures in 2017 compared to long term averages, below. As for the Thomas Fire, this was not simply a reflection of a very dry fall. The system generating these Santa Ana winds was very atypical, lasting at least 10 days. The longest Santa Ana event associated with a massive fire in California is the 1932 Matilija Fire with Santa Ana winds lasting 5 days. No doubt the winds were a major driver, and the duration and recurrence was impressive this winter. While obviously driven by strong, dry and gusty winds, as is typically the case for fires in California’s coastal zone, the most unusual and decisive conditions leading to the recent wildfires had to do with the warmth and dryness of preceding months. Probably the wetness of the previous winter also played a role via buildup of light fuels. The timing of the SoCal fires (e.g. the Thomas fire) occurring in December strongly reflects the bone-dry fall. These fires highlight how challenging “attribution” is for a given event, even when there are greenhouse-gas-related factors that could have contributed in various ways (e.g. epic drought in preceding 5 to 6 years, very warm preceding summer, extreme precipitation variability this fall/winter). The winds were of course necessary for such unusual sizes/losses, and you don’t have fires without ignitions, but there are certainly suggestions of climate change here that can’t be ignored. 3. What can we say about trends in California climate relevant to fires? 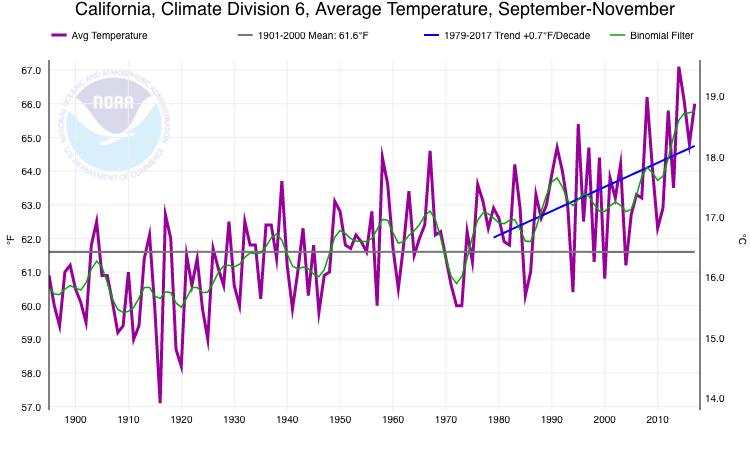 California is now a much warmer place than it used to be, and the long-term trend toward hotter summer and autumn periods is directly linked to climate change1,2. There also appears to be an emerging trend toward autumn drying, especially across Southern California. However, there have not been, to date, any clear trends in the occurrence or intensity of Santa Ana wind events. Thus, some of the key meteorological conditions that produced the devastating late 2017 wildfires in California are plausibly linked to climate change, while others may not be. Global warming patterns are likely to make fires more severe in the montane forests in the Sierra Nevada and northern California. In lower elevation landscapes in the state the evidence that global warming will impact future fires is equivocal. Direct effects of seasonal temperatures over the last 100 years do not show any significant correlation with fire activity. However, warming may have indirect impacts, particularly on recovery patterns that may alter vegetation succession trajectories. 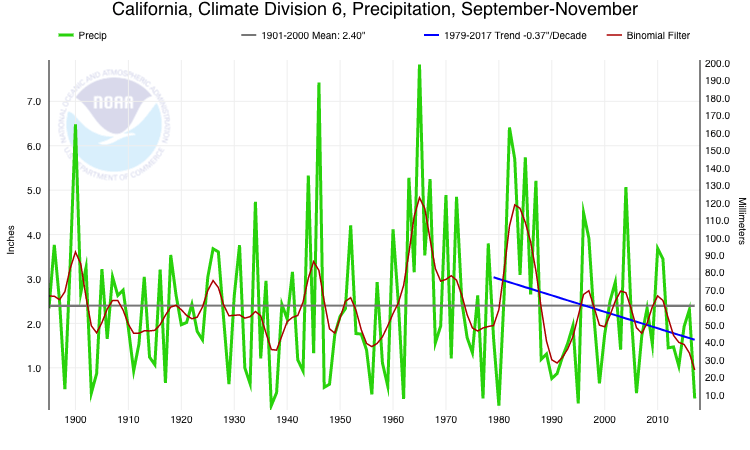 Besides increasing warming, climate model projections of precipitation in California (mid-late 21st Century) exhibit diminished precipitation in spring and fall, which would provoke earlier and longer periods of dry natural fuels in California, adding to the effects of warming. Climate models also exhibit a tendency for greater numbers of dry years, which may exacerbate the risk of wildfires in some settings. The climate change connection here is a precipitation regime change story. Midlatitude regions are becoming more subtropical with midlatitude storm activity getting confined to the peak of the winter season. This makes autumns more likely to be dry, making dry fuels persist and extending the fire season into the peak of the Santa Ana season into December and even January. This season was a glimpse into what future fire seasons will more often look like. By the way, the only significant precipitation event this winter in SoCal was in early January and was strong enough to cause mudslides when heavy precipitation fell on a burned-out landscape. This also perfectly exemplifies impacts of the projected less frequent but more extreme precipitation. For more on precipitation regime change, see this release from Scripps. 4. How unique is California in regards to fire trends/factors—are many of these things true for other parts of the West (or other regions)? The role of global warming in increasing fire activity in California montane forests appears to be evident across the mountain ranges of interior western states. Much remains to be determined about the role of climate in fire regimes in non-forested landscapes in the Great Basin. In parts of California, the potential for Santa Ana winds during a prolonged period of very dry fuels (fall and in some cases, early winter) can lead to a long fire season with the potential for severe fires. 5. What important human controls on fires and fire damage apart from climate change are relevant to the California story? One of the most surprising things I’ve learned from recent fire research is the degree to which people are the cause of wildfires. I think the term “wildfire” makes it seem like we’re not part of the equation, when in California humans start 85% of wildfires and are responsible for two thirds of area burned. There are a lot of fire-prone landscapes in California, and past land use practices have likely increased fire risk in those regions. I think there are two main points to think about moving forward—first is how we can reduce risk from known human causes. Some human sources, like arson, are unpredictable, but others, like campfires, agricultural burning, power line fires, and rail road sparks, could potentially be predicted and reduced. (Especially during windy times of year!) Second is how we ourselves adapt to living in fire-prone landscapes. Building homes in the wilderness creates a huge challenge and expense for fire fighting. If the state as a whole wants to reduce the costs of prevention and the costs of rebuilding, we need to start being smarter about where we choose to live. Fire prevention is a major avenue for future changes in fire activity. In particular, powerline ignited fires need far more work to ascertain how to alter this source as it is one of the only sources of ignitions that has not changed in the past four decades.Whereas other dominant ignition sources such as arson, debris burning, equipment fires, etc., have all declined since 1980, powerline fires have remained the same or increased. Holding power utilities responsible for damages stemming from preventable power-line related ignitions (e.g. recent CPUC ruling disallowing SDGE to cover their losses related to the 2007 wildfires started by power infrastructure by raising rates on consumers) can lead to better practices on the part of power utilities and eventual decrease in power-line-related ignitions. 6. 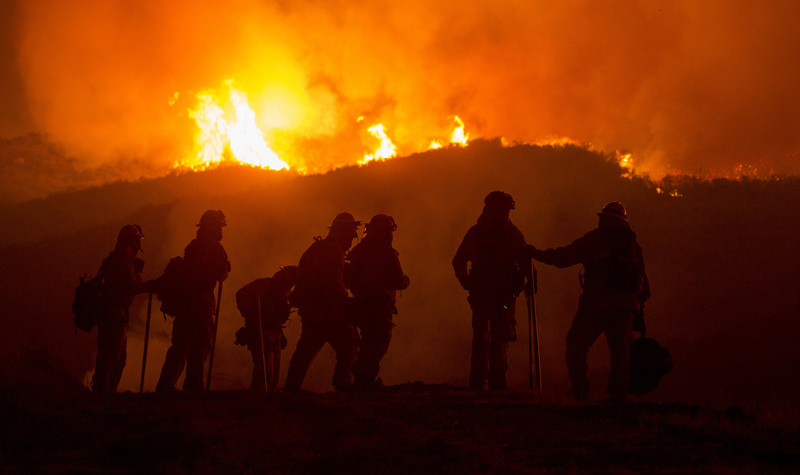 Are fire fighting strategies changing because of climate trends? Incident commanders report seeing more extreme weather and erratic fire behavior. In some cases, they report seeing fires making bigger runs than predicted. Since fire prediction models are based on past fire behavior, predicting future behavior is challenging. Incident commanders come into their positions with a life of professional experience. If they haven’t seen or witnessed fire conditions or behavior like they are seeing now, that makes it challenging because they cannot draw on that previous experience to address current day challenges. In general, concerns about fire fighter safety and the need to find tactical footholds given these kinds of conditions means that we are seeing more indirect strategies, where you build a line further out from the fire’s edge and conduct burnouts to remove fuel in the hope to stop the fire. Of course, that can only be done where conditions allow for it and not every place will allow for it. That also sets up potential for some conflict in how fires are fought. As fires grow in size, they cover multiple local, state, and federal jurisdictions. This means you need to involve multiple fire-fighting agencies and they can have different philosophies about how to approach wildfire fighting. Some agencies are more aggressive in their fire fighting strategies and tactics than others, so that means you need to have excellent communication, coordination, and cooperation on the fire line to ensure everyone is on the same page. 7. What questions might research head toward for more clarity on CA fire trends/outlook? The 2017 fire season in California is a wake-up call for the fact that scientists have not given sufficient guidance to managers. Issues that need to be resolved are: What do these wind events tell us about future wind events—should we expect more ‘freak’ events like these? Do current management actions focused on pre-fire vegetation management have the potential for solving fire problems throughout the state? We know fuel treatments are of critical need in forests where fire suppression has greatly altered historical fire patterns, but there is good evidence these treatments are of minimal value in non-forested landscapes where fire suppression has not effectively eliminated fires in the past. Excessive fuels are not the problem in these landscapes, which are juxtaposed with metropolitan areas. It is becoming evident that the influence of land development patterns can rival that of long-term climate influences (i.e., on both fuel productivity and flammability) when it comes to predictions of fire activity. Key research questions remain, however, about what future land development patterns will emerge and the degree to which land use planning can help create safer communities. In addition, the frequency and intensity of future droughts—more episodic than the long-term averages typically used in models—is a gap in our knowledge. Having realistic climate model projections of interannual variability in precipitation, and also annual sequencing of specific conditions, will allow for better future projections. Lastly, and possibly one of the most crucial unknowns, is how climate change may alter extreme fire weather events (i.e., hot, dry winds). Shifts in the timing and/or severity of events like the Santa Anas across much of southern California, the sundowner winds of Santa Barbara, or the Diablo winds of the San Francisco region will have major impact on fire regimes and the people living in these areas.